Imac 27 in a1312 ssd installation was not a replacement of existing hard drive. Rather an addition of second hard drive by removing dvd drive and using that bay to install SSD. that way ssd becomes a fast boot drive with operating system on it and the existing hard drive you have as a storage drive. this is a nice feature you can have on imac 27 a1312 ssd installation and not only on this model, but pretty much on any imac that has a dvd drive. at this day and age that would be all models before 2013 models. with a simple bracket as you can see in the image on the right. it replaces dvd drive and then 2.5 inch SSD drive goes right into it. and connects to the logic board via dvd sata connector. its pretty neat and simple. the advantage of this kind of move of course is loading speed and overall operational speed of the system because solid state (SSD) drives they have much faster write and read rate than most of regular drives. and also you can have a big hard drive as storage which currently is available at 6TB or perhaps even larger drives. with imac like that you can do a lot and do it pretty fast. 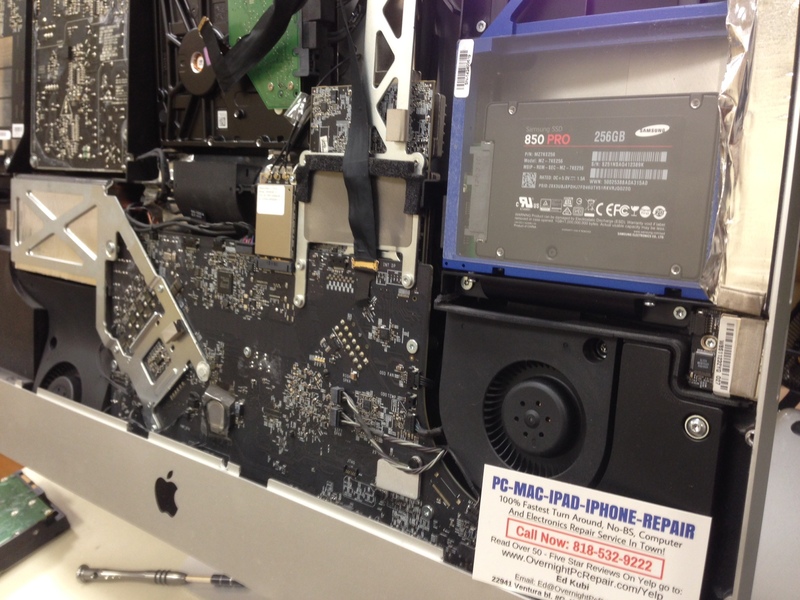 and since mac talk woodland hills, ca has closed its doors, the only place in woodland hills and calabasas area you can have this sort of thing done professionally and fast is Overnight Pc Repair and Mac. this job took about 4 hours total. and most of it was because a person had a lot of files that had to be backed up from old drive. otherwise it was done in less than two hours. which is pretty much at the speed of light. mind you with every job like that you not only get an upgrade on your imac and also you get a basic clean up of fans, which is important on these imacs. those two fans you see often get clogged with dust and that might damage its internal components. so cleaning fans is a must.